We are edging closer and closer to the opening of the 7th movie at the end of this week, at least here in the US, and it’s appropriate that as part of our little celebration of Harry Potter and LEGO, that we feature a MOC focused on a location that was important early on in the books and movies, and will probably be the closing scene of the movie. As you can see in the comments that follow, it is a different take on what happens to the station after the events of the 7th and 8th movies. 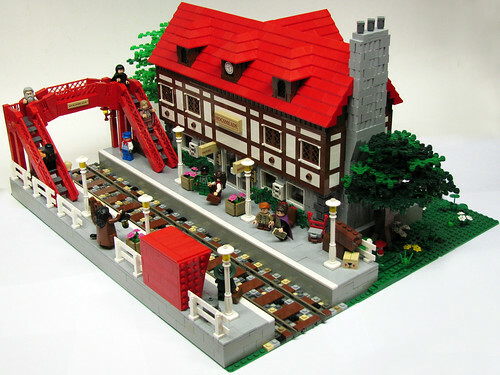 It’s a nicely done version of Hogsmeade Station/Hogwarts Station. Hogsmeade Station, or Hogwarts Station, is where the Hogwarts Express ends it journey on the 1st of September. As you can see, this is not the tiny and dark platform as described. Let’s say, after the defeat of the Dark Lord the Ministry of Magic invested in a new Hogsmeade Station. They upgraded the whole building and it now not only serves as a railway station, but also as a restaurant and hotel. I hope you like it! I’ve started building this in August 2009, the roof was then ready. In February it was almost ready, but then I lost interest in it. In the summer holiday I placed some orders and I finally finished it last Sunday. A lot has changed in a year, I kept adjusting it until I was satisfied (unfortunately I’ve deleted WIP photos and I can’t find my first sketches). It’s my biggest (and most expensive) project ever and I’m happy with the result. It’s going to be a part of my Hogsmeade layout. If you’d like to see more, check out Matn’s Brickshelf gallery, including several scenes of the interior. This was featured on The Brothers Brick back in October.